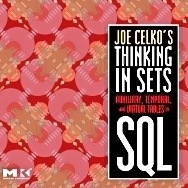 Thinkins in sets is a great book by Joe Celko’s. This book tell us about concepts how we need to think when we were working with databases. and “last” rows are totally meaningless. I agree when he write “One of the first things that a newbie does is use a proprietary autonumbering feature in their SQL product as a PRIMARY KEY”. This is completely wrong, and it violates the definition of a relational key. and cannot be in a table, by definition. That’s how I think and was totally wrong before. So lets do something sets!